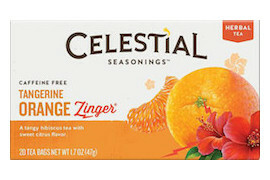 In this lively blend, tangy tangerines, juicy oranges and a whisper of passion fruit flavor mingle with sweet, tart hibiscus - whose deep red color and tangy flavor give Zingers their zing. Possessing delightfully soothing qualities when hot, this tea is especially refreshing served over ice. Ingredients: Hibiscus, rosehips, blackberry leaves, hawthorn berries, orange peel, natural tangerine flavor with other natural flavors. Contains soy lecithin.